Nuclear power as "a very important part" of the White House's energy strategy, Department of Energy Secretary Rick Perry said Monday. Projects such as small modular reactors are on the front burner, he said. The Trump administration sees nuclear power as "a very important part" of an all-of-the-above energy strategy, Department of Energy Secretary Rick Perry said Monday. "Bringing our nuclear energy industry back, small modular reactors for instance, that's on the front burner so to speak," he told CNBC's "Squawk Box" on the sidelines of the SelectUSA Investment Summit, which promotes investment in the U.S.
Perry's comment offers some insight into the administration's spending priorities as it seeks to slash funding for Energy's research and development programs by 54 percent from 2016 levels. Offices that would see deep cuts — unless Congress intervenes — include those responsible for promoting energy efficiency and extending the life of nuclear power plants. Nuclear reactors currently generate about 20 percent of the country's power. 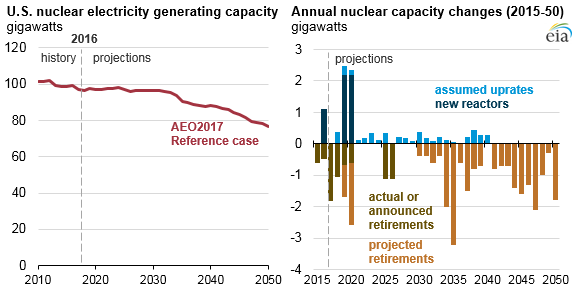 The U.S. Energy Information Administration projects that share will decline to 11 percent by 2050 as some of the nation's aging nuclear power plants retire, and due to competition from natural gas and renewable sources. That has raised concerns that a significant chunk of the country's zero-emissions electricity generation could come offline, making it harder to rein in greenhouse gas emissions if that power is not replaced with solar, wind and other renewable energy. The viability of future large-scale nuclear plants has recently come into question. Industry leader Westinghouse filed for bankruptcy in March as delays and cost overruns piled up at new nuclear plants in Georgia and South Carolina. The Department of Energy has promoted research into the small modular reactors that Perry mentioned. These small reactors can be combined and produce up to a quarter of the typical power that traditional nuclear plants generate. They aim to keep nuclear power in the mix while avoiding the huge investment cost of new large plants. The Department of Energy in 2013 awarded Tigard, Oregon-based NuScale Power a matching grant worth up to $217 million over five years to develop its small modular reactor system. The goal is to put the technology into commercial use by 2025. Large-scale nuclear research and development projects have attracted inconsistent budgetary support, and many have been put on hold or terminated, according to a white paper from Columbia University's Center on Global Energy Policy released in March. Bureaucracy and logistics have made it hard for developers to access research and development facilities, the report said, raising concerns about American competitiveness in cutting-edge nuclear technology. "The lack of accessibility — and often the available capabilities — of R&D or test facilities has driven some innovative nuclear reactor developers to seek facilities outside the United States," wrote Timothy Frazier, a former senior Department of Energy official, in the report.